Our bulk foodservice noodle soups are used often as a base for many restaurant dishes. Noodle soup can be served ala carte on a salad bar. Buy ramen noodle soups from the restaurant supply superstore at wholesale pricing. Campbell's Chicken Noodle Soup 10.75 Oz. Campbell's Chunky Bowl Classic Chicken Noodle Soup 15.25 Oz. Campbell's Chunky Classic Chicken Noodle Soup 19 Oz. Campbell's Healthy Request Chicken Noodle Soup 50 Oz. 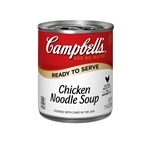 Campbell's Ready To Serve Easy Open Chicken Noodle Soup 7.25 Oz. Campbell's Ready To Serve Low Sodium Chicken Noodle Soup 7.25 Oz. Campbell's Ready To Serve Low Sodium Chicken With Noodle Soup 50 Oz. Heinz Chicken Noodle Soup - 49.5 Oz. 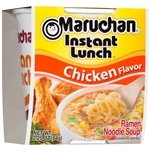 Maruchan Ramen Oriental Flavor Soup 3 oz. Vanee Foods Condensed Chicken Noodle Soup - 50 Oz. DU Jour Chicken Noodle Soup - 13.3 oz. Bulk Noodle Soups are used in many different restaurant applications such as buffets and soup bars as well as used to make custom sauces and dishes. We carry every different type of commercial noodle soup available for restaurants and foodservice companies including the famous ramen noodle soup. There is nothing better to beat the winter and sick seasoning than chicken noodle soup.